I’d like to establish a regular posting schedule, but there’s only so much I can say or rehash about game design. Designing and thinking about how concepts work is a very exhilarating, but I think this website could offer much more than just my fledgling design thoughts. I’ve decided to also post about my gaming experiences in general: favorite games, memorable moments, newly acquired games, and maybe even some “how to play” videos. When I have a completed product, I’ll link to where it can be purchased. That’s a long way away though! These posts will be mostly free-form and consist of part game review, part session report, and part general musings. 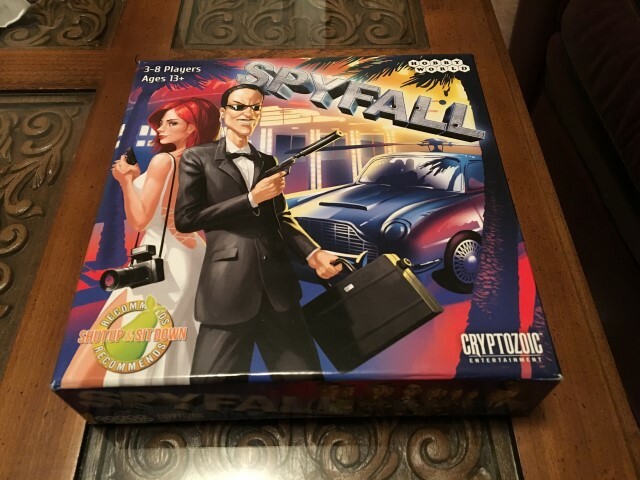 I bought Spyfall during a Black Friday sale, and I’m very glad I did. It’s one of the weirdest games I own, and when you actually break it down and think about it, it’s surprising that it actually works within what I traditionally think of as a game framework. It’s a very outside the box type of game, and those can be tricky. 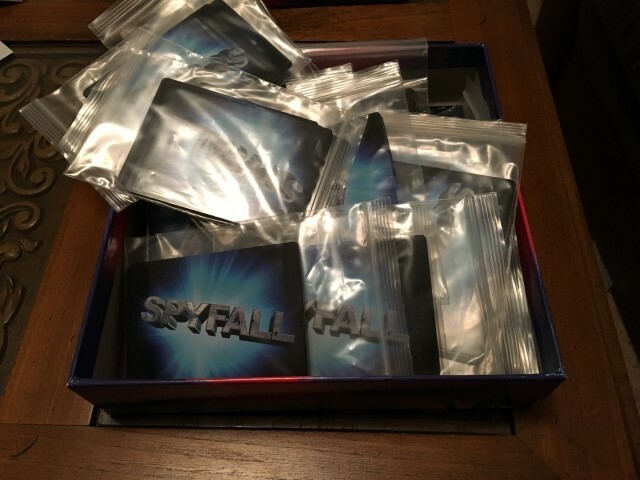 Spyfall is a party game for 3-8 players. The game comes with 30 decks of 8 cards with 1 Spy card and 7 identical Location cards per deck. A deck is randomly chosen, then 1 person is randomly dealt a spy card and the other players are randomly dealt the identical location cards. 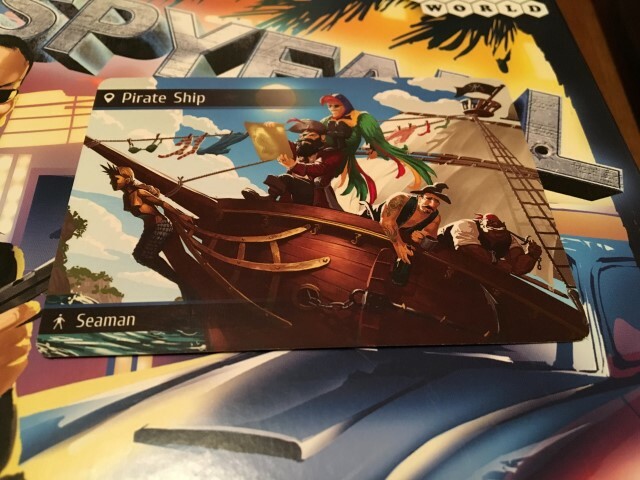 The location cards also have an optional role that is different on every card. At first we ignored these, but later found out they were helpful in providing inspiration on how to answer a question. The spy has to figure out where everyone is and everyone else has to expose the spy without revealing their location. 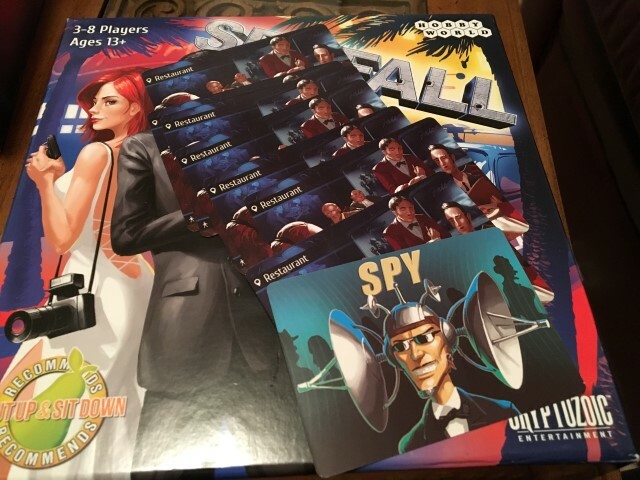 At it’s core, Spyfall is game about Q&A with a dash of Dixit mentality. Your questions and answers should be specific enough to avoid suspicion but not too specific to give away the location to the spy. It took a few rounds to get the hang of this deceptive concept. The most suspicious looking player starts the line of questioning by singling out another player and asking him/her a simple question. It can be ANYTHING! You haven’t known fear until you are the spy and have to answer “how did you get to work today?” as the first question. 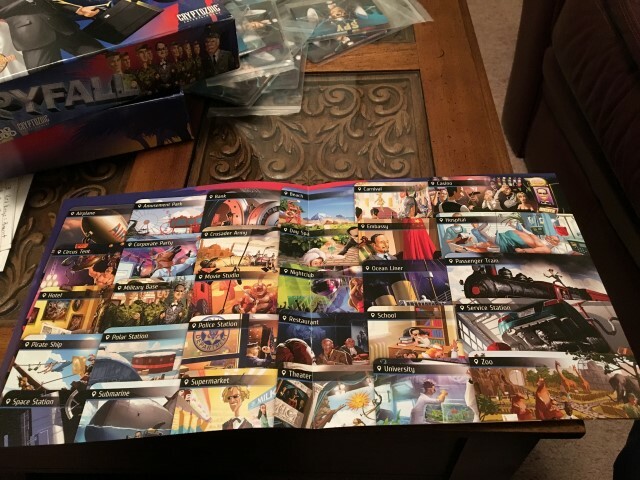 The game comes with a two page poster with pictures of all 30 locations. We passed this around when a player had to answer the question to make it a little fairer for the spy. It would be pretty obvious if the spy was the only one constantly looking at the reference sheet! Would you make new friends on the Pirate Ship? This gives the spy something small to go on and helps set the game framework in the player’s minds. Maybe everyone is chilling at the Polar Station? Perhaps drilling together on the Military Base? Probably not in the Casino, on the Ocean Liner, or at the Supermarket. It also tips off other players that you are probably not the spy when you give an answer that fits the location. A master spy can sometimes pull this off as well, and those games are quite entertaining. A simpler answer just wouldn’t have been fun, and a bunch of those in a row will really frustrate the spy. Being the spy is hard enough already! The game has a scoring system and round timer that we ignored completely. I feel like this is the sort of game where points don’t matter and you are just playing to experience something unique. Much like Whose Line is it Anyway, the score is made up and the points don’t matter. The game is hilarious when played with people who don’t care about winning and losing and just want to have a fun time. You’ve got to be in the right mindset to fully enjoy this game. If you try to “game” the questions and answers, the fun factor drops significantly. We just asked questions until the spy either revealed himself and tried to guess the location or someone was nominated and unanimously voted the spy. Obviously the accused does not get a vote. Playing this way also had the side benefit of being able to jam out 10 or so games relatively quickly while exploring new questions and new locations. The artwork is excellent. It’s vibrant and the pictures are pretty funny. I rate this game an 8 using the BGG scale, on the conditions that the players don’t take it too seriously or try to game the system. A tall order to ask of some players…but if you can get around this hurdle it’s a fantastic and memorable game. Playing without a timer or point system also made the game more accessible and easier to teach. 10 – Outstanding. Always want to play, expect this will never change. 9 – Excellent. Always want to play. 8 – Very good. Like to play, will probably suggest it, will never turn it down. 7 – Good. Usually willing to play. 6 – Fair. Some fun or challenge at least, will play occasionally if in the right mood. 5 – Average. No significant appeal, take it or leave it. 4 – Below average. Slightly boring, could be talked into it on occasion. 3 – Poor. Likely won’t play this again although could be convinced. 2 – Very poor. Annoying, I plan to never play this again. 1 – Defies description of a game. You won’t catch me dead playing this. Clearly broken.